The Sky+ app for the iPhone is one of my favorites. It seems beyond the realms of possibility to many people when I show them. It’s usually followed by a quick download from the AppStore.. and then a “what now?”. So I thought I’d write this setup guide to make it a bit easier to explain. In order to get the Sky+ app working on your iPhone, you need to first create a Sky “iD”. Sky needs this so that they can associate your Sky+ box at home with some sort of username and password. It is also used by the iPhone app to make a connection. 1. Creating a Sky iD account. You create a Sky iD account on the MySky.com website – mysky.sky.com. On the left hand side, you will see a log in box. 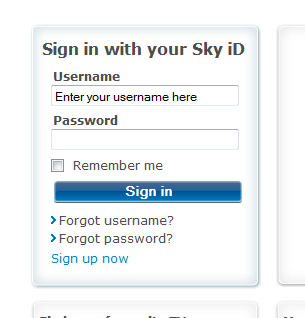 Simply click on the “Sign up now” option and register with your name, address and Sky account details as requested. You will also choose a Sky iD and password – this is what you will use in the next step. 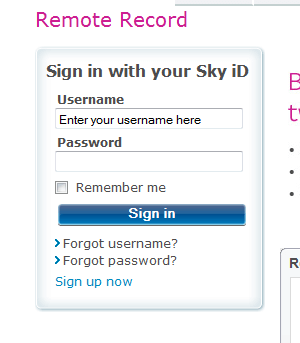 Simply login with the Sky iD and password you created in the last step and then follow the instructions for linking your Sky+/Sky+HD box (whichever you have). You’ve done everything you need to link your Sky account to your Sky+ box, so now simply enter your Sky iD into the iPhone app and select your broadcast region.. and you’re done. One of the most useful and impressive iPhone apps on the market.. have fun. Thanks Matt all done, great to be able to record Rugby on a Sat when I have forgotten to do it when away…! Really good to see you both on Sunday, fab lunch. hey there, we have 3 sky boxes in our house, how do i connect my app to my box?